How To Data Management On Nintendo Switch - Here's an introduction Data Management On nintendo switch, the types of data that can be saved on Nintendo Switch and the different ways you can manage that data. Software data includes downloadable versions of software, downloadable content and update data. It doesn't include save data. The possible save destinations differ depending on the type of data. This data is saved to a microSD card if one is inserted and will be saved to the system memory if the microSD card is full. 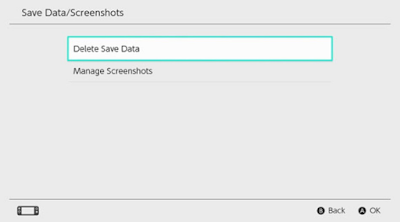 You can select a save destination for screenshots via System Settings ⇒ Data Management ⇒ Save Data/Screenshots ⇒ Manage Screenshots. This data is saved in the console's system memory. Even if you are playing the retail version of a game, this data will not be saved to the game card. It cannot be saved to a microSD card either. 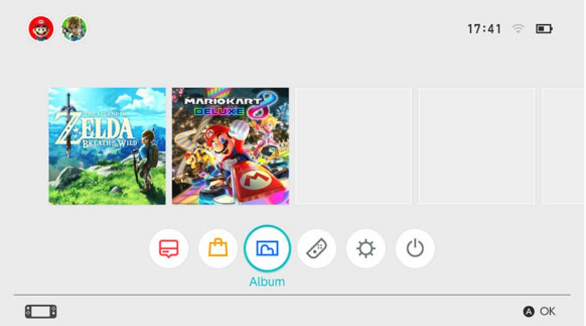 Open Album on the HOME Menu, then press the X Button on the list of screenshots to select images to delete. 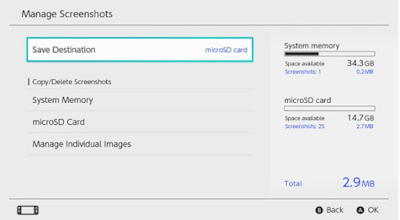 If you'd like to manage all of your screenshots at once, go to System Settings ⇒ Data Management ⇒ Save Data/Screenshots ⇒ Manage Screenshots. 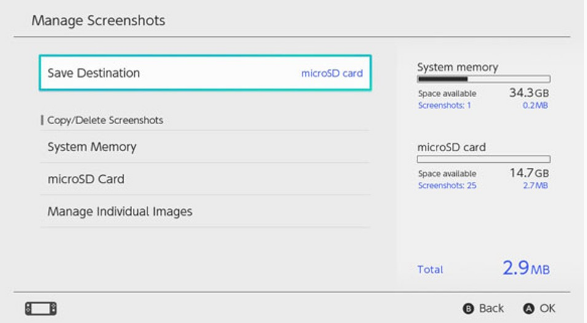 There you can delete all of your screenshots or copy data between the microSD card and the system memory. All of your save data will be saved in the system memory. 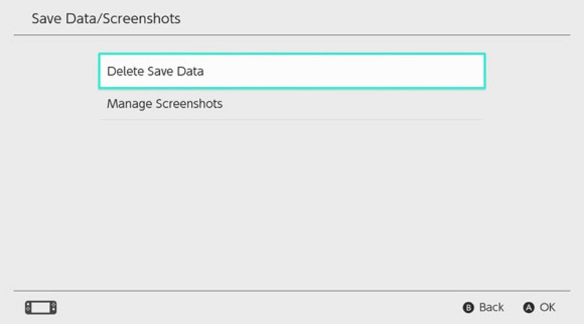 You can delete save data for each individual software via System Settings ⇒ Data Management ⇒ Save Data/Screenshots ⇒ Delete Save Data. 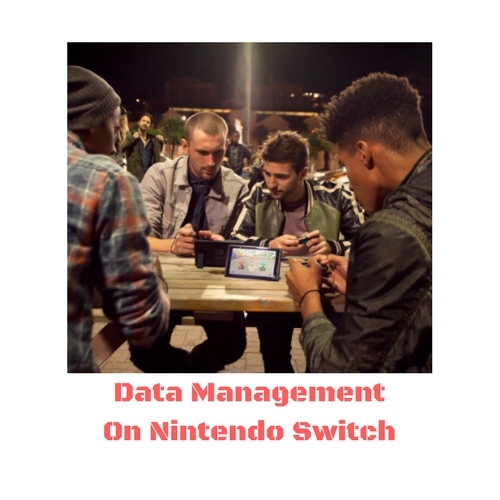 You can delete all data and return the Nintendo Switch console to the state you bought it in by restoring factory settings. 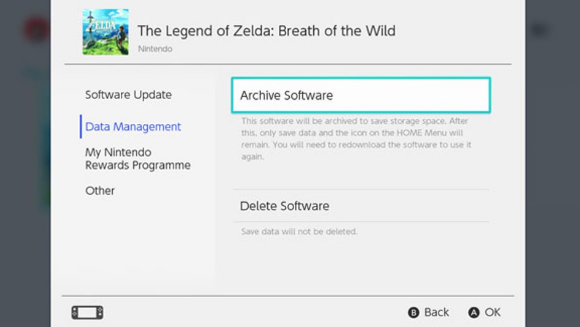 All information saved on the Nintendo Switch console, including user information, internet settings and game-related news articles, will be deleted.